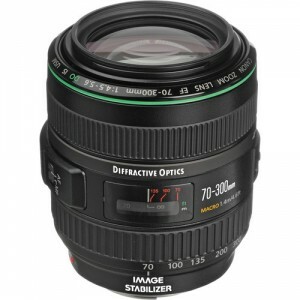 The Canon EF 70-300mm f/4.5-5.6 DO IS USM is a compact 70-300mm zoom lens feature a unique optical technology called “Diffractive Optics” (DO). This unique system allows for Canon to make the lens significantly more compact than a standard 70-300mm. The lens features Canons Image Stabilization and USM focusing systems but carries a rather hefty price premium over the standard Canon EF 70-300mm IS USM lens. I have not formally tested this lens, but have been intrigued due to it’s small size and significantly lower price when purchased used. Image quality does not seem to be as good as the less expensive 70-300mm lenses. based on 190 user reviews online.